Tasty crunchy nuts are an abundant source of multiple health benefits and this is the reason it is the number one recommendation by the diet neutrinos to the patients with major health concerns. Here we will discuss regarding some vital benefits of nut nutrition for health. These healthy snacks are a good substitute for unhealthy fried and processed snacks especially when you are out of your home because you can easily carry them along with you during traveling hours. A recent study has proved that some of the nuts consumption is helpful in controlling the blood sugar level and it prevents the risk of developing type 2 diabetes. Apart from this it improves your heart health, reduces cholesterol level and prevents the rapid weight gain issue. In one term we can say that this is the one stop solution for all the primary health concerns along with providing good taste to your mouth. Some popular nuts that you can easily avail from market include walnuts, cashews, resins, almonds, chestnuts, Brazil nuts, macadamias, pistachios, pecans, hazelnuts, etc. What type of nutrition does nut provides? Nuts are the natural abundant source of many healthful nutrients such as proteins, vitamins, carbs, dietary fibers, minerals and healthy fats such as monounsaturated fats and polyunsaturated fats, etc. Each nut contains its unique list of nutrients however all of them contains some common nutrients. 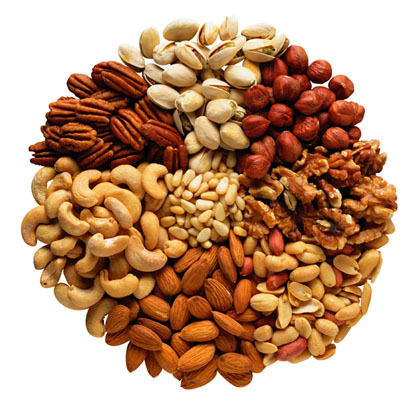 The below-mentioned list shows the nutrients content of some vital nuts. Nuts have very low sodium content rather they contain more potassium and carbohydrates in natural sugar form which makes them beneficial for health. Nuts exist in the top lists of the Mediterranean diet which is considered to boost overall health due to its natural essence. If you are following Mediterranean diet then having 30gram of nuts each day can provide you with following health benefits. A reduction in BMI value and waist circumference. Reduced risk of heart attack, stroke and other severe cardiovascular health risks. Reduction in diabetes and metabolic syndrome health concerns with a comparison to low-fat diet following pattern. The nutritional value of the raw and roasted form of nuts are a little bit different. Whether the nuts are oil roasted or dry roasted it absorbs a very low amount of oil because of its density. Nuts lose its water content to some extent during the roasting process and also reduces some B grade vitamins content as they are not heated adaptive. If someone is willing to eat sodium free nuts then they can buy unsalted and dry roasted nuts. Mostly oil roasted nuts are salted one which has very high sodium value with a comparison to the raw nuts. Roasting enhances the taste of nuts and makes them more delicious than the raw forms of nuts. Can Nuts Consumption Cause Allergy? Some tree nuts such as Brazil nuts, pecans, almonds, walnuts, cashews, pine nuts, macadamias, hazelnuts, and pistachios. A recent study has indicated that eating nuts can have some special health benefits other than the conventional benefits. However, this needs more research before coming to any conclusion. Boosts brain’s health by slowing down the aging process of the brain. Reduces the issue of macular degeneration which can even lead to blindness. Prevents the risk of gall-stones. Nuts are rich with anti-inflammatory properties which protect your body from inflammation issue when you consume them. Inflammation is the body’s own healing process from injuries, harmful bacteria, and pathogens. However, prolonged or chronic inflammation is dangerous and it can even damage the affected organs by increasing the risk of the diseases. In these conditions eating some healthful nuts can improve the condition by reducing the severity of inflammation to a great extent. Consuming nuts ensure healthy aging and longevity. 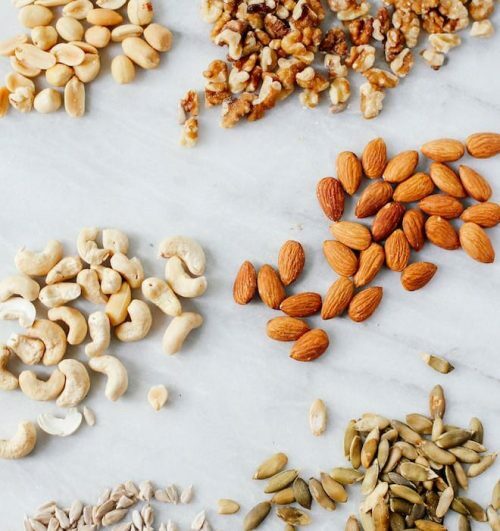 Some nuts which are considered best for reducing inflammation in both healthy people and in the cases of people with severe diseases, include almonds, walnuts, pistachios, Brazil nuts, etc. In spite of its goodness and effectiveness for reducing inflammation, there are still some contradictory views regarding nuts effectiveness in reducing complete inflammation in healthy people. However, it is good for people with kidney, diabetes and other major diseases. Nuts are the huge source of antioxidant which is a vital property that makes it beneficial for every person. It protects you from the attack of free radicals which are big enemies for skin beauty and health. Free radicals are unstable molecules which are good in a limited quantity as an immune response. However, it’s exceeding growth can cause cell damage. It is generally produced as a part of metabolism but in the cases of excess sun exposure, stress and pollution its quantity exceeds which is called oxidative stress. Regular consumption of nuts helps to combat the oxidative stress by deactivating free radicals to prevent the cells from damaging. The polyphenols or anti-oxidant existing in nuts like walnuts, almonds, etc. protect your cells and LDL cholesterol from damage to a great extent with a comparison to other antioxidant-rich meals. Metabolic syndrome is a cluster of many severe health concerns including heart diseases and it is very much associated with type 2 diabetes. People with diabetes and metabolic syndrome have to be very diet conscious as all foods are not good for their health condition. However, the good news is that in both these chronic form of health issues nuts are considered a favorable diet as it helps to improve the condition to a great extent. This is because nuts are low in fats and carbs. Moreover, it doesn’t stimulate the blood sugar level. Eating nuts help in reducing primary symptoms or concerns of these two major health concerns such as high blood pressure, oxidative stress, etc. Daily intake of nuts will prevent the risk of developing heart diseases which is quite possible in people with these two major health concerns. Nuts consumption has great benefit in reducing the risk of heart diseases and stroke. This is because both these primary health concerns are associated with artery functions. So by boosting the functionality of arteries, it decreases a life-threatening risk. Apart from this nuts is beneficial for cholesterol level, inflammation, and LDL particle size which together are correlated with the heart health and brain functionality. LDL particles play a vital role in heart diseases. One study has cleared that the small and dense LDL particles are more dangerous for the heart than the large-sized LDL particles. Nuts help to decrease the small LDL particles and increase large LDL particles. Also, it increases the good cholesterol level. Overall it can be said the regular consumption nuts protect you from the risk of heart attack and stroke by increasing HDL cholesterol, LDL particle size and by enhancing artery functionality. Having a high level of cholesterol and triglycerides in the body can cause you to develop chronic heart disease which can be life threatening too. These two health concerns mostly develop due to the use of excess oil in foods which is stored in the form of fat and calorie. However, with nuts intake, you can control these health concerns to a great extent and ensure a healthy living. Nuts like pistachios help to lower the level of triglycerides in diabetic and obese people within 11 to 12 weeks of regular consumption. Nuts contain polyunsaturated and monounsaturated fatty acids which are two primary factors which can reduce the high level of cholesterol to the normal level. Some nuts like hazelnuts and almonds can reduce the total cholesterol and LDL cholesterol. At the same time, it can increase the HDL or good cholesterol level. Nuts are also helpful in the weight loss process in spite of its high-calorie content. This is because our body is not able to absorb all the calories existing in a nut because one vital portion of fat in nuts are trapped within the nut’s fibrous wall during the digestion time. One study conducted on two groups of women, one of them were given olive oil to eat and the other group was given nuts like almonds, walnuts, etc. The second groups of ladies were managed to reduce their weight, especially in their waistline than the first group who consumed olive oil. This means that the calorie quantity mentioned in the packaging of any nut foods are not actually can be absorbed as a whole and this is the reason it won’t show any effective change for increasing total calorie intake in the body. Suppose if in the packet of any nut diet its calorie detail is mentioned as, 1ounze serving has 150 to 160 calories, in that case, your body will only be able to absorb around 119 out of those calories. So people who ignore nuts during their dieting period due to its high-calorie content are at myth as eating nuts during the dieting period can speeds up the weight loss process by helping them to reduce a good amount of weight within few weeks of regular consumption. Nuts are the rich source of fiber which is an essential element for overall good health. Fiber intake has several health benefits out of them its benefits for reducing overweight is most important. As fiber cannot be digested easily in the body so it keeps your stomach full for the longer period that means you don’t feel frequent craving either for big meals or for unhealthy snacks. So it helps to reduce your weight faster. Apart from this, it is good for gut health. As it cannot be digested so gut bacteria ferment it and convert it into the Short Chain Fatty Acid (SCFAs) which is beneficial for the gut health. Along with improving the gut health SCFAs is helpful in controlling diabetes and obesity health concerns. Fat is harmful to our health but it is also divided into two categories one is good fats and another is bad fats. Nuts are considered as a source of good fats which promotes good health. Nuts and seeds are the good sources of two essential fats for health which are monounsaturated fatty acid (MUFAs) and polyunsaturated fatty acids (PUFAs) which help to reduce the high level of cholesterol and increases the good level of cholesterol. These two are essential fatty acids for our health which we hardly get from our regular diet intake because they are generally burnt during the processing time of foods. 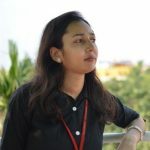 This is the reason it requires to be obtained in the supplemented form such as through nuts and seeds intake as in the lack of these fats many health issues can develop. In this context, you must be aware that each nut has different nutritional value than the other one. Some have the higher value of few nutrients and some have a lesser value of some nutrients. 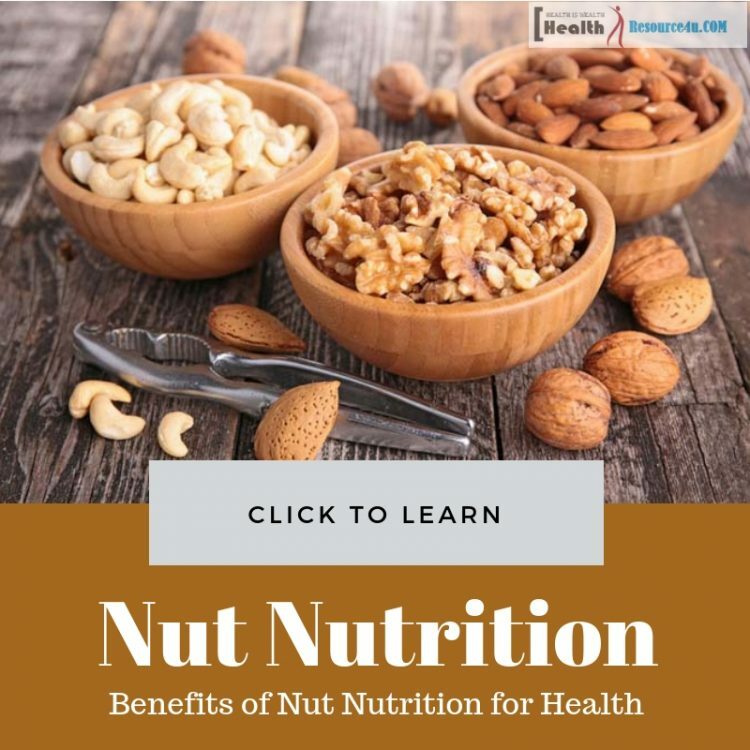 The above-mentioned benefits of nut nutrition for health clarify the significance and impact of regular nuts intake in our overall health and lifestyle. So, ensure long and healthy living with a mixed handful of nuts and save your money that you might have to expend if you fall sick due to any severe disease.